The seasons of Advent and Christmas seem to come so quickly and to be filled with many activities to say the least. In the everyday planning and preparations for family and community celebrations there are inevitably certain individuals who for whatever reason go unnoticed or unrecognized. They make important contributions. They are invaluable in their presence and support but are quiet and simply unassuming in their role. If you wish to recognize them and thank them they are often reluctant to accept such praise and notoriety among the many others who are present. It has often struck me that in the Advent and Christmas season this could quite easily describe the role of St. Joseph, if it were not for certain Gospel passages and the celebration of Feast dedicated to the Holy Family of Jesus, Mary and Joseph which falls on the Sunday immediately following Christmas. There is also a reference to Joseph at the beginning of the octave period, the eight days leading up to Christmas which the Church highlights through the praying of the O antiphons. It is in Matthew’s Gospel where he sets out the origin or genealogy of Jesus Christ, son of David, son of Abraham, and then traces his human descent by bringing his ancestral line down to his mother’s husband, Joseph. To speak of our Lord, the son of the blessed Virgin Mary, as true and perfect man is of no value to us if we do not believe that he descended from the line of the ancestors set out in the Gospel. On the fourth Sunday of Advent this same Gospel (Matthew), it recounts how Joseph received the news of the impending birth of Jesus, of the circumstances of Mary’s virginal conception through the power of Holy Spirit. And then despite his initial resolve not to take part in this event we hear of the night in which the angel appeared to him in a dream where he receives the assurance, guidance and courage to take Mary as his wife into his home. Unlike Mary he is asleep and does not question the meaning of this dream or the message of the angel. Tradition has described this as the “faithful obedience” of Joseph. It is the silent, dutiful action of accepting and taking on the responsibility of caring for others. He was called to a unique role, to self-giving, sacrifice, to the promotion of human life, and to the protection of the Holy Family of Nazareth. This same testimony is also very much reflected in the life of Brother Andre of Montreal who was recently canonized by Pope Benedict XVI. He is popularly known as the Apostle of St. Joseph, for his life and witness to Christ and his faith in the intercession of St. Joseph to bring healing to many who sought him out. In fact it may be providential to reflect on the life and spirituality of the saintly door-keeper from the College Notre-Dame as a living example of the life and model of St. Joseph that we encounter especially in this Advent Season. Sanctification in the lives of the saints is a gift from God. However that is only one side of the story. The other part involves their own active detachment of all that would come between them and the love of God and others. It is often this active sanctification in a saint’s life and work which results in a deeper union with God and others through grace. 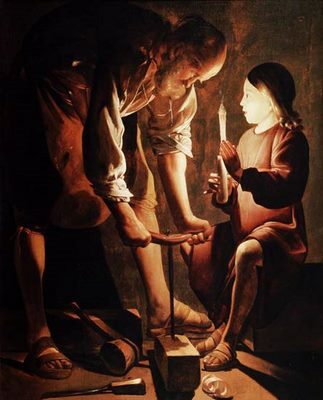 This sanctification might be described as the “faithful obedience” which developed in the life of St. Joseph and Brother Andre despite the circumstances of their lives. As we have come to know Brother Andre faced many challenges in his younger years; poor health, the death of both parents at an early age, being raised in a foster family, a lack of education and thus a limited ability to read or write, and physical limitations which prevented him from having steady employment. What is most interesting is that these experiences did not result in his turning inward on himself with pity or of being angry and bitter, but instead through grace these experiences led him to prayer and to seek consolation in God. As one autobiographer stated “it led him to silent contemplation”. These trials brought him closer to God, to prayer, to a deeper faith and trust in God and to the conviction of his devotion to St. Joseph. You might say that this was the beginning of his active sanctification. 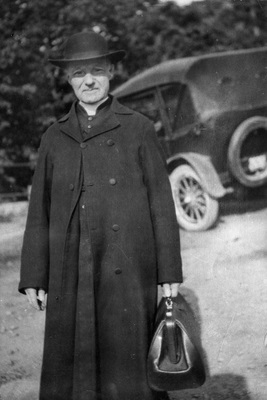 In the second part of his life this sanctification came through the experience of his role in the Community of the Holy Cross as door-keeper at the College Notre-Dame. This ministry opened him up to the needs of others and developed within him an approach to people which was characterized as one of acceptance and compassion. He quietly went about his duties, accepting whatever responsibilities he was given in the community. He took care of the needs of the young students, his brothers in the community and all the people who came to the door seeking his prayers. As his notoriety grew and the number of people seeking assistance increased he remained humble. He always attributed the miracles of healing to St. Joseph and often described his role by saying “I am nothing but Saint Joseph’s little dog”. His devotion to St. Joseph also inspired him in practical ways to model Joseph’s role in promoting the human relationships that come from family, in imitation of the Holy Family. The closeness of God is revealed in the mystery of the Holy Family. In fact family relationships can reveal the Triune God and can become the incarnate meeting place of God and human persons. The relationships of the Holy Family are transformative of our humanity. And so Brother Andre who in his life lacked this human presence of family nevertheless developed a spirituality of life which promoted human relationships by reaching out to the needs of others which was transformative and healing. The spiritual reality and indwelling of the Holy Family today finds its meeting place not necessarily in Nazareth but in St. Joseph's Oratory which was inspired by Brother Andre. Each year the Advent season provides us with a wonderful opportunity to reflect on the mystery of St. Joseph in the plan of salvation. It is also a specific grace for us in Canada to enter into such a reflection in light of the recent events of the canonization of Saint Brother Andre. It would be very important for us to acknowledge the presence of such unique individuals in our lives of faith this Christmas. To take note of those family and friends who witness to us of St. Joseph and Brother Andre through lives of faithful obedience, in humbling accepting the responsibilities of their vocation, in reaching out to the needs of others and in promoting human relationships which are transformative and which allow us all to experience the closeness of God.